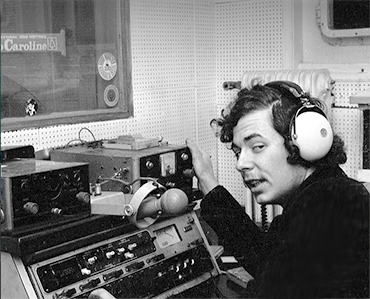 Lion Keezer grew up listening to the great British offshore radio stations in the 60s. Many of the great hits and artists of that time: Beatles, Stones, the Who or Procol Harum he heard first on pirate stations such as Radio Caroline and Radio London. DJ’s Johnny Walker and Robbie Dale were inspiring heroes. Free Radio was big fun. London was happening and pop culture was on the rise. Another teenage dream came true in 1974, when Veronica and RNI had to close down and when the Mi Amigo team moved to Spain: Lion also came to shore and became a journalist and editor for the leading Dutch/German monthly music magazine 'Muziek Expres'. There he interviewed heroes such as Beatle George Harrison, Rolling Stone Mick Jagger and many others.. In 1979, he became 'Head of Press and PR of the International Artists department' at the leading record company in the Netherlands: Phonogram Records (Philips). There he worked closely with great international artists such as Elton John, Dire Straits, Genesis, Phil Collins, 10CC, Kiss, Status Quo, Rush, Van Morrison, Dusty Springfield and many more, organising their publicity, interviews and photo shoots. In the early 80s Lion produced international music video clips for a.o. UK's ‘Middle of the Road’, and The Star Sisters, while also returning to pirate broadcasting as a DJ for another radio legend: Amsterdam’s popular land based pirate radio station ‘Radio Decibel’ 96.2 FM. 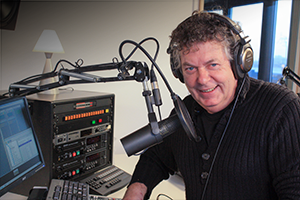 His professional broadcasting career would continue in the 90s, at VARA Television, one of the 4 main Dutch national broadcasting organisations. There he headed the department responsible for all TV on air programme promotion, corporate identity and where he was in charge of the broadcasting process as a director of its daily TV broadcasts. Five years later he started an Internet company and left the ‘old media’ for the new, exploring the many new ways of mass communication and multimedia. Today Lion is living both in Amsterdam and Bali, working as a producer and director of multimedia projects and music video’s. He still has a weak spot for ships, especially the Greenpeace fleet of campaign ships, on which he sometimes volunteers as a tour guide or night watch when they are in their home port Amsterdam. Since mid 2015 he is heavily involved with Radio Mi Amigo International, where he still has 3 weekly radio shows. So many years after his first involvement with the MV Mi Amigo, now much of the fun is to use all the professional skills and knowledge he acquired over the years to help further build and develop this legendary station. 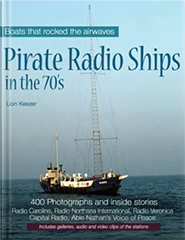 In 2014 Lion created an iBook dedicated to the great Pirate Radio Ships in the 70's, making use of the hundreds of pictures he had taken on 5 different radio ships, back in the day. “It’s not just ‘a’ history of the pirates", he says, "it’s my personal history with them, with over 430 pictures and text. I spent most of my adult life in the music business and RTV media. All of that was seeded during my younger years, when new music and inspiration came to me via these very radio ships and the legendary stations they carried. Well, maybe not entirely, because for Radio Mi Amigo International, I'm broadcasting on Shortwave, a new unexpected adventure and a first for me. I'd like to imagine this is what the original Radio Mi Amigo would sound like with today's technical possibilities - and of course it's great fun being on the radio again and now be able to say: 'Hello to The World'..!"